By the time Kashmir passed into the hands of the Mughals in the 16th C., these gardens embedded with the Persian spirit were already established in Kashmir. 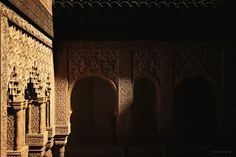 What perhaps the Mughals did later was to work on a refinement of the set pattern, and thus taking them to a new height. Before the Mughals set foot in Kashmir in the 16th C., it was already home to various ruling dynasties beginning with the ancient Hindu kings to the Shahmiris and the Chaks. Kashmir had, however, always been a pre-occupying thought for the Mughal emperors. The sheer beauty of the place along with its potential to be exploited as their favourite hobby of laying out pleasure gardens may have fascinated them. Mughals attempted to annexe Kashmir even during Babur’s lifetime. During Humayun’s reign, the place was for ten years ruled by his uncle Mirza Muhammad Haider Dughlat, in the Emperor’s name. In 1585 A.D, Akbar waged a war against Yousuf Shah, a Chak ruler but was defeated. A treaty was nevertheless signed on Kashmir. Within a year it was broken and Akbar dispatched another army to Kashmir. After a stiff battle, the Emperor was victorious. From this time onwards, Kashmir was ruled by the Mughals as one of their provinces through their governors. Emperor Akbar paid three consecutive visits to Kashmir and with each one his love for the place grew more and henceforth Kashmir became the summer resort to successive Emperors: Akbar, Jahangir, Shah Jahan and Aurengzeb. To Jahangir, Kashmir seemed a paradise of which ‘priests had prophesied and poets sung’ (Gascoigne et. al., 1971). For nearly a century and a half these four great Emperors came, from far away Delhi and Agra, in stately progress across the Pir Panjal, with glittering retinues and splendid state, with escorts and audiences, tributes and labour, from the dusty glamour of an Indian court to the cool and quite of a Kashmiri summer. Jahangir spent fourteen summers in the Valley of Kashmir, coming in with the blossoming of the lilac and the wild iris in the spring, and setting out back towards the hot plains of India when the saffron flowers had bloomed in autumn. He died in Bahram-Galah (a small village near Poonch), almost within the sight of his beloved and favourite land. Mughal rule in Kashmir may not have been impressionable politically but it will always be remembered for the eternal legacy they left behind, including the gardens, arts and crafts. The celebrated Mughal gardens of Kashmir owe their grandeur primarily to Emperor Jahangir who had an undaunted love for Kashmir, and his son Shah Jahan. Jahangir was responsible for the careful selection of the site and manoeuvring it to suit the requirements of the traditional paradise gardens. Although the Mughals never deviated drastically from the original form or concept of the gardens, their biggest challenge in Kashmir was to exploit the chosen site and the abundance of water resource to its maximum potential. The sites selected were invariably at the foot of a mountain, wherever there was a source of water either in the form of streams or springs. This feature eventually resulted in terraced garden layouts. Undaunted by the challenges offered by mountainous terrain, the Mughal engineering skills and aesthetics helped in exploiting the dominating natural landscape and the available water resources to their maximum potential and achieved an unparalleled height of perfection. Almost all popular Mughal gardens in Kashmir except Verinag follow a similar pattern with a central water channel sourced at natural springs. This channel which formed the central visual axis of the garden was further enhanced by avenues of poplars or chinartrees. There are one or more baradaris or pavilions with a central open space ‘dalan’placed over these water channels. These water channels cascade down from one terrace to another in the form of chadars or falls, where they fill in the larger water tanks, hauz, squarish in form and having an array of fountains. Finally, the water from the central channel joins a water body, either a flowing stream nearby, as in case of Achabal, or a lake, as in case of Nishat Bagh and Shalimar Bagh. Laid out in the 17th C. (1634 AD) by Mirza Abul Hasan, the Nishat Bagh is amongst the most prominent gardens that the Mughals developed in the erstwhile Hindustan. 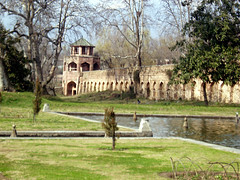 The bagh or garden is located directly along the eastern bank of the Dal Lake on the foot of Zabarwan mountain range. The garden stretches out over a rectangular area of approximately 116.70 acres, and measures about 556.50 x 350.00 m, which equals 6 quarters (3 x 2) of the traditional chahar bagh concept. Nishat Bagh’s exceptional quality lies therefore in its setting, the complex terraced layout, the play of water cascades, the views it offers, and its ecology. Length-wise, the garden consists of twelve terraces, supposedly symbolizing the twelve signs of the zodiac. The width of the garden consists of seven linear sections, which make up three main sections; a central wing with the main water features and two lower laying side wings. The terraces in the garden rise not only from the Dal Lake up the mountain side, along the length of the garden, but also along its width from the side wings to the central channel axis. The sophisticated geometrical manner by which the chahar baghconcept and terraces have been adapted to the contours of the mountainside contribute towards making Nishat Bagh one of the finest representations of traditionalchahar bagh garden layouts spread across the Islamic world. Of key significance is the location of the garden along the bank of, with the lowest terrace directly connecting to the lake and with key historic views from the terraces and pavilions to the lake. The Oont Kadal, a historic bridge located in the lake, forms an integral part of the composition, as key views from the garden align with it and continue across it to the Hari Parbat Fort, which rises above Srinagar across the lake. 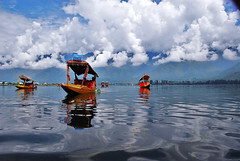 The views towards the vast Dal Lake from each of its ascending terraces are wide and uninterrupted, presenting the full expanse of the wide Dal Lake and its western shores. The historic approach to Nishat Bagh, coming from Dal Lake and passing under the Oont Kadal on a boat, similarly offers remarkable views and reveals the full scope of the rising terraces and the wider historic agricultural landscape and mountain backdrop. The central axis with the water features contains the main ornamental water features and pavilions. The side wings and terraces were predominantly terraced orchard plantations with irrigation channels, terraced walks and shading avenues. The uppermost terrace was the zenana or the private section of the garden. Nishat Bagh was a more private garden than its near neighbour, the Shalimar Bagh, which was also used for holding Royal Durbars. It therefore did not require having as many associated buildings as Shalimar Bagh. Yet the magnificence of the garden is so powerful that it often enjoys more praises than the Shalimar Bagh. Key historic architectural structures include the water channel, the water cascades and pools, the fountains, the terrace walls, the boundary walls, stone abutments at the bank of the lake, pavilions, and the watch towers (burjis) at the corners of the zenana reaining wall. Early origins of the Shalimar Bagh garden and cultural landscape go as far back as the 6th C. As it is believed that at Shalimar a villa was built by Pravarassena II in the late 6th Century, when the garden was a sacred site. The small village at the site retained the name Shalimar, while the villa and garden vanished. In the 16th C. An early Muslim King, Zain-ul-Abidin, is said to have created the canal and a bund (embankment) to Shalimar. The Farah Bakhsh, the ‘Joy-Imparting’ garden or lower garden of Shalimar Bagh was created by Emperor Jahangir around 1620. The construction was overseen by Prince Khurram, the later Shah Jahan. Like the Nishat Bagh, this garden was also developed along the lines of traditional chahar baghconcept. After his accession to the throne Shah Jahan added the Fayz Bakhsh, the ‘Bounty-Bestowing’ garden or the zenana to the earlier Farah Bakhsh at Shalimar Bagh. 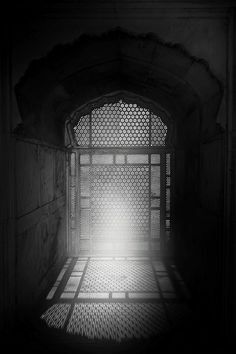 The work was carried out around 1630 by Zafar Khan, the Mughal governor of Kashmir and included the building of the black marble pavilion in the zenana. The present size of the garden measures approximately 594 x 250 m and represent five main terraces that make up two and a half chahar baghs. The whole of the royal garden was divided into two major parts as per the requirement of the royalty. The lower portion, comprising the first three terraces was the Diwan-i-Aam where the emperor used to hold public audience. The upper two terraces were exclusively for the Emperor and his courtiers and hence rightly called the Diwan-i-Khas. These two parts were screened by means of a thick masonry wall having two similar gateways at each side of the water channel. This area was also called the zenana and, as the name suggests, was a private zone for the Empress and her ladies. Shalimar Bagh is more ostentatious in architectural quality when compared with its other parallels in Kashmir. Almost all the terrace edges at the Shalimar Bagh have something interesting to offer in the form of pavilions, pools, or water cascades. The whole texture of the garden, in fact, is a result of the relationship of the garden’s built and landscaped environment. The scale and decorations of the buildings, however, seem to have been intentionally underplayed by the Mughals to avoid offering competition with the overarching natural beauty that surrounds the garden. The two most important structures within the Shalimar Bagh are the Pink Pavilion, in the Diwan-i-Aam zone of the garden, and the Black Pavilion, located in the Diwan-i-Khas.Considering that there was not much building activity by the Mughals in Kashmir, compared to the rest of India, these structures offer a rare opportunity to witness Mughal architecture in this region. The Pink Pavilion is located over the water channel of the second terrace. It is a rectangular open pavilion constructed in traditionalbadshahi bricks. The significant architectural details of the Pavilion comprise thepapier mache ceilings, the carved columns, brackets and railings made of stone. The Black Pavilion (also an open Pavilion), rectangular in plan, is located on the fourth terrace in the zenana. Constructed principally in brick masonry, the walls of the Pavilion have stone facing, with recessed niches and naqashi (paintings) on walls. Outstanding workmanship is displayed in the carvings of the stone columns and brackets around the Pavilion. The name, Black Pavilion, is related to the stone used for the walls and columns, which appears very black when polished. The enclosed garden has six watch towers; at each of its four corners and also in the middle. Despite the fact that the original Mughal planting scheme has worn-out over the years, the garden is lush with, flowers, well-mowed turf and some fruit trees. The outstanding quality of Shalimar Bagh lies in the synthesis of its landscape and architectural features. The wider setting of the rural agricultural landscape, the rice fields and hamlets, the historic canal that links the garden to Dal Lake, and the mountain backdrop, all contribute to the significance of Shalimar Bagh. Apart from this, while most other significant Mughal Gardens of India are commonly an associated feature of a mausoleum or a monument, the Shalimar Bagh should be valued for the fact that it is amongst the very few surviving authentic Mughal gardens that were developed for pleasure, enjoyment and also for holding Court. The Shalimar Bagh therefore is testimony to the lavish Mughal lifestyle which made the Court escape, every summer, from the scorching heat of the Indian plains, and travel hundreds of miles to find respite in the greens of the garden. The royal garden of Achabal is located near Anantnag predates the arrival of the Mughals in Kashmir. It was renowned even during the time of the Sultans of Kashmir in the 15th C. when an orchard garden existed at the site. The ancient Hindu text of Nilmat Purana mentions the existence of a spring by the name of Achapal Nag at the site. The present garden was laid by Empress Nur Jahan in 1620 and was named after her as Begumabad. The garden was also known as Sahebabad during the Mughal period, in memory of the Mughal Emperor Jahangir. The spring at the Achabal Bagh was popular at one time for its curative values and the amount of water it supplied. The Achabal Bagh, with its abundant Chinar trees and roaring water channels, is yet another embodiment of the Mughal landscape genius demonstrated in Kashmir. The garden is trapezoidal in shape with an area of around 9.7 acres and follows the traditional char bagh concept. It is developed on the base of a forested mountain, locally known as Acchabal Thung. The pre-existing garden was greatly enhanced and rearranged by Empress Noor Jehan and consisted of four gently ascending terrace levels, based on the theme of the chahar bagh. The central feature of the garden is the spring, whose water is collected in a canal (nahr), branch canals (jadwal, juyee) with platforms (nashiman) and pavilions (baradari) built over the water channel. The spring which is presently protected under a modern shelter feeds the entire garden for its irrigation as well as aesthetic needs. It combines the appeal of a stately stone bordered pleasance lying in between ordered avenues of full grown trees with the natural rock and woodland background. A hammam was constructed within the garden by Jehanra Begum, the eldest daughter of Emperor Shah Jahan in the 17th C. The remains of an earlier baradari or pavilion can still be seen on the site of the spring. The mountain (Acchabal Thung) looms impressively over the garden and creates a splendid background for it. The Achabal Bagh is remote and is still largely unaffected by urban development or civil infringement and therefore there are good opportunities for defining buffer areas around it for its long-term protection and sustenance. The Achabal Bagh may seem similar to other Mughal Gardens of Kashmir in terms of layout but it is strikingly distinctive in its visual quality and experience. The scale of the garden is also modest when compared with its other parallels in Kashmir, yet it is unique for its remote location and natural setting. Furthermore, the garden continues to rely on its original source of water supply which for some other Mughal Gardens of Kashmir and elsewhere has either eroded or disappeared over the course of time. The garden was developed around a natural spring that existed in the area by the name of Achapal Nag, explaining where the name of the garden originated from. The garden was developed on the orders of Emperor Shah Jahan in 1632 by Ali Mardan Khan around an abundant spring emerging from the slopes of the Zabarwan Mountains. The waters of the spring are renowned for their cool and rejuvenating qualities. Oriented on the north-south axis, the garden is arranged on three ascending terraces. The total area within the rectangular garden perimeter is approximately 1.73 acres with a width of 70.83 m and length of 122.81 m, approximately. 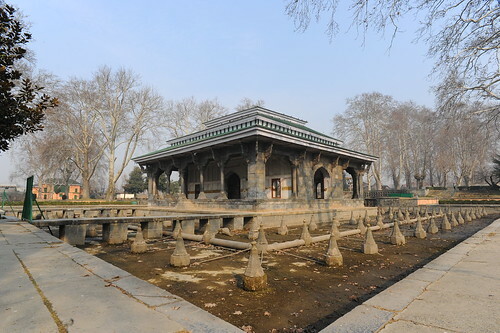 The spring is sheltered under a pavilion which is of a later Kashmiri period. The water from the spring, located at the uppermost edge of the garden, is led through narrow water channels that drop sharply in the form of cascades to successive lower terrace levels. The defining feature of this garden is its very high terraces and strong Mughal character of its gateway, cascades and retaining walls. Chashma Shahi continues to retain the natural spring around which it was built and is unique for its high terraces, and distant, yet outstanding, views of the Dal Lake from its terraces. The garden is known to be at its best during late afternoons and evenings. This garden stands out from the rest of the gardens for its narrow rills and singular fountains within its pools – adopting the typology of early Mughal gardens of India. Pari Mahal is also located west of the city centre of Srinagar, near Chasma Shahi, on the slopes of the Zebanwan mountains. Prince Dara Shukoh, the eldest son of Shah Jahan, built the gardens around 1650. It was built at the site of the ruins of a Buddhist Monastery and as a residential School of Sufiism at the instance of his revered spiritual tutor Mullah Shah Badakhshi. It is believed that Pari Mahal was constructed for astronomical observations and teachings or astrological calculations under the Mughals. Dara Shukoh named it after his wife Nadira Begum, supposed to be known as Pari Begum, the daughter of Prince Parviz, a son of Jahangir. Pari Mahal has a domed ceiling with gardens laid out on six terraces around. Arched retaining walls support the terraces, which vary in width. The garden is 122 m by 62.5 m at its widest. The terraces can be accessed via sets of steps on their corners. A pavilion or baradari can be found on the fourth terrace and another one connects the fifth and sixth terrace. The garden is entered from the fourth terrace where there are a series of entrance buildings, which are believed to have contained a hamman. The gardens are said to have been watered by a nearby spring. There are water tanks on the terraces, but unlike most Mughal Gardens in Kashmir, the garden contains no water channels and cascades (chadars) that feed the water tanks. Instead water is supplied through a system of underground pipes. Verinag is an octagonal pavilion-garden, built around a spring which is the acknowledged source of Jehlum River5 and also its principal feeder. The garden was constructed by Mirza Haider, an able engineer of the Mughal Court at the behest of Emperor Jahangir. A Persian quatrain indicates the date of construction of the garden as 1619-20. The garden was enlarged further between 1626 and 1627, during Emperor Shah Jahan’s reign and was renamed Shahabad. The spring is enclosed within a perfectly geometric octagonal arcade with a fairly wide stone walkway that surrounds the spring. In plan, the garden is a large octagonal tank connected to a very long and straight water channel (12′ wide and 1000′ long) going towards the north that reaches a point where it discharges to feed the Jehlum River. The spring is believed to be at its deepest around 15.24 m and has abundant trout fish, which is claimed to have never been consumed owing to certain religious sentiments. This attitude has helped in maintaining the spring as a rich fish-reserve. A number of baradaris, royal bathrooms, were also constructed in the garden, which have been lost over time. The garden, as many Kashmiri Mughal gardens, was repaired extensively during Dogra period in 1870s. The outstanding quality of Verinag is the blend of the surrounding landscape with the formal geometry of the garden. The abrupt rise of the densely forested hills creates a distinctive background to the arcaded pavilion around the spring. While the forests are rich in deodars6, the blue-green waters of the spring are replete with fish. The formality created by the octagonal perimeter around the spring and the linear water channel suddenly disappears when the water merges with the natural course of the Jhelum River. Verinag was the personal favourite of Emperor Jahangir and it was his great wish to be buried here. All the above six mentioned gardens are generally categorized as later Mughal Gardens, which have evolved from their earliest prototypes like the Humayun’s Tomb Gardens and thus are representatives of Mughal Gardens in their highest state of development. These gardens therefore, apart from being of exceptional beauty, are important and irreplaceable physical evidence to the understanding of Mughal Garden evolution and culmination. As key examples of this tradition these gardens are also an outstanding and irreplaceable resource for the understanding of garden history in general and the Mughal Period in India. The spectacular, mountainous natural settings, within which all of these gardens are laid, are perhaps impossible to be found in any of the other Mughal Gardens of India. Apart from these factors, the Mughal Gardens of Nishat, Shalimar, Achabal, Chashma Shahi, Pari Mahal and Verinag also demonstrate the excellent engineering skills of the Mughals in making optimum use of the difficult topography and abundant supply of water when laying out these pleasure gardens at the specifically chosen sites. 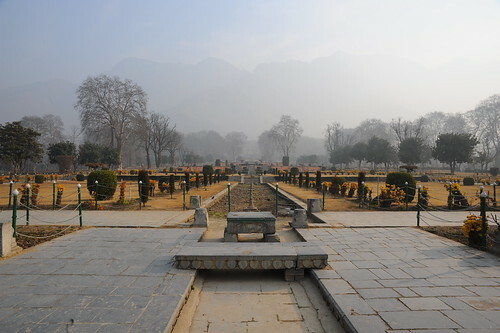 The use of the terraces as raised walkways (khayabans) and the numerous cascading chadars are given the topography key features in the Mughal gardens of Kashmir. The gardens of Nishat, Shalimar, Chasma Shahi and Pari Mahal near Srinagar also demonstrate an outstanding ingenuity in creation physical and visual links with Dal Lake and key landmarks. A factor common to all the mentioned gardens is ecology and the experience of senses. Rich in verdant qualities, and in particular the Chinars, the gardens experience a change in colour with changing seasons, from the pale green tones of the spring to the rich greens of summers which transform to the warm tones of red, browns and orange in the autumn, before the foliage turns stark and melancholy in the winters. This unique characteristic of the gardens can greatly influence the sense of experience while visiting the gardens. Considering the immense historical significance of these gardens, their inscription on the UNESCO List of World Heritage Sites will bring in a much needed international attention and appreciation to the gardens. The inscription will also help clarify objectives and responsibilities of the stakeholders who currently manage these gardens. The Mughal Gardens of Kashmir are an exceptional testimony of the creative and innovative ingenuity demonstrated by the Mughals in taking maximum advantage of the rising slopes of the mountains and the natural setting to fulfil their extraordinary landscape ambitions and needs. The gardens demonstrate the excellent engineering skills of the Mughals in making optimum use of the difficult topography and abundant supply of water. These gardens are unique and most representative surviving ensembles of a period of prolific activity that saw the creation of over 700 gardens in Kashmir during the Mughal Period. The methods and traditions employed in the creation and development of the gardens and their wider landscape settings are significant examples of the interactions between people and the natural environment. The existing continuity in land use and management of the gardens and, most importantly, their wider landscape settings is a significant tradition within the context of safeguarding the environment under growing pressures of urban developments and change. The gardens are categorised as later Mughal gardens and therefore, apart from being of exceptional beauty, are an important and irreplaceable physical resource for the understanding of garden history in general and the evolution of Mughal garden and landscape history and traditions. In terms of visual quality and physical attributes, the Mughal Gardens of Kashmir are unique and singular. The gardens and wider landscape settings are outstanding examples of the Mughal type of architectural and landscaping ensembles in a mountainous environment. The gardens are directly associated with the Mughal Period in Kashmir and are a testimony to the flamboyant lifestyle of the Mughal Empire which flourished in India between the early 16th and mid 19th Centuries. The annual reopening on the 13th of April of the gardens is associated with Baisakhi, a popular festival of the Sikhs, which marks the formal arrival of spring in most of India. Within the context of the ICOMOS Nara Charter on Authenticity and the ICOMOS Florence Charter for Historic Gardens it is felt that the outstanding values of the gardens have been maintained and that their integrity and authenticity as exceptional testimonies of Mughal civilisation in Kashmir have been safeguarded. Based on an assessment of historic records it was concluded that the gardens retain high degrees of their historic fabric and that the key areas of the properties continue to be managed and maintained by as historic gardens by dedicated horticultural and engineering departments. The gardens remain substantially authentic in their layout and essence, and the philosophy and concept they were based on. The gardens retain their spirit of place and their setting continues to contribute to their values, with their sophisticated terraces and water systems continuing to stand out as outstanding features. The gardens retain their historic size and boundaries, which ensures a complete representation of the features and processes to convey the property’s significance. The gardens contain all significant material evidences of architecture, landscape and/or archaeology (in various states of preservation and maintenance) that are important while discussing their authenticity and connection with the Mughal Dynasty at its peak. 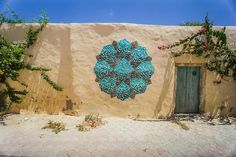 While the gardens are living pieces of heritage and have continued to change and evolve, they retain their sense of place. Where development occurred this added new significant layers to the properties, such as important educational or visitor facilities, and has been limited to reversible and temporarily impacts. Some similarities with other properties on the World Heritage List can be found but nevertheless the Mughal Gardens of Kashmir stand out for a number of reasons, which are summarised below. In India the gardens must be compared with the Mughal gardens of the Taj Mahal at Agra and also the gardens of the Humayun’s Tomb, Delhi, both inscribed on the World Heritage List. Though there are similarities in the underlying concept and the principles of chahar bagh layouts on which they all are based, the Mughal gardens of Kashmir stand out because they are not just an associated feature of any monument but have their own distinctive identity. Humayun’s Tomb and the Taj Mahal were both constructed as Tombs, which were set in gardens. The Mughal Gardens in Kashmir were all created as gardens of pleasure and beauty. Three other gardens to which a comparison must be made the Shalamar Gardens of Delhi, the Red Fort in Delhi and the Shalimar Gardens of Lahore. The Shalamar Gardens of Delhi have been completely lost, and the Shalamar Gardens of Lahore are currently on the UNESCO’s List of Heritage in Danger. The Mughal Gardens in the Red Fort were again associated with a main building, the Fort, and have also been altered and lost to a high degree. As described under the statement of integrity, these six Mughal Gardens in Kashmir have retained a high degree of integrity and authenticity and are still thriving and amongst the most favoured sightseeing destinations in Kashmir. In Asia a useful comparison can also be made with the Classical Gardens of Suzhou in China. The gardens were inscribed on the World Heritage list under criteria (i), (ii), (iii), (iv) and (v) considering that the four classical gardens of Suzhou that are included must be seen as masterpieces of Chinese landscape garden design. The gardens perfectly blend art, nature, and philosophies and create as such ensembles of great beauty and peaceful harmony. The same could be said about these six Mughal Gardens of Kashmir which are masterpieces of another significant era of garden history. Of interest is also that the gardens of Suzhou are a serial nomination. In the case of Suzhou these four gardens are a selection of a larger number of gardens from this era and are seen as being integral to the entire historic urban plan. Classical gardens in Suzhou that lost much of their authenticity and integrity, or were lost altogether, were also not included in the World Heritage listing. The six Mughal Gardens in Kashmir can also be seen as an integral part of the Kashmir Cultural Landscape and particularly in the case of the four gardens in Srinagar, they also form an integral part of the wider urban landscape of the city and Dal Lake. garden and is listed as one of the most comprehensive and refined examples of Renaissance culture. As in the Mughal Gardens of Kashmiri, also fountains, ornamental basins and terraces make Villa d’Este a remarkable and unique example of the 16th C. Italian Renaissance garden. Fontainebleau, a medieval royal hunting lodge, in the Ile-de-France, illustrates the influence of the Renaissance on a palace and park in 16th C. France. The Palace of Versailles is included on the World Heritage List as the ultimate endeavour in Baroque landscaping from the 17th C., with the mid-18th C. Palace and gardens of Caserta in Italy was created to rival the Baroque monumentalism of Versailles. 18th and 19th C. garden history in Europe is also represented on the World Heritage List by properties such as the Royal Botanic Garden at Kew and Studley Royal in the United Kingdom. While stylistic comparisons can be made with other garden properties on the World Heritage List from other regions, continents and periods, the Mughal Gardens in Kashmir developed as a unique landscaping expression within the wider history of garden art. Within the Mughal Garden heritage they particularly stand out from the other parallels for their extraordinary geographical locations. They are the most excellent testimonies of this prolific period of garden creations by the Mughals and from the period that represented a height of the Mughal gardening craftsmanship. These gardens, created as integral art pieces within the unique character and context of the Kasmir Valley, must therefore be seen as masterpieces of mountain-side type Mughal Gardens.